Let’s face it—we love our screens. Young or older, small screens or large, we devour content on our devices. Sometimes it’s a good thing, sometimes not so much. For this post, we’ll go with the good thing angle. If we’re being honest, let’s admit that even on an absolutely stunning day, you’re tempted to hang inside to catch the ball game or World Cup match. Or maybe you really want to catch up on your recent Netflix binge. Nothing wrong with that except that you’re missing an absolutely stunning day outdoors! And your family might be missing you a tad, too. This begs the question: why can’t you be outside and watch TV too? You can, but please. This does not mean you should drag your 60” screen onto the patio with an outdoor extension cord. Most definitely not. You need a TV built for outdoor use. This means a TV much brighter and sharper than a typical indoor TV. Outdoor TVs are also specially designed to withstand the elements including weather, dust, insects and salt air. You’ll also select an outdoor TV based on the kind of outdoor space you have—sunny, shady or part sun. And we’re definitely talking about no visible wires or extension cords. Once you select your perfect outdoor TV, you can pick out outdoor speakers to take your entertainment to the next level. Just think of the possibilities. Yes, you can catch the game (or at least the big plays) or Netflix episode while you and your family are outside, together. But how about outdoor family movie night? Maybe a Fortnite marathon? We understand that everyone loves their screen for their own reasons. But if we’re talking about enhancing how family and friends spend time together–especially outdoors during summer–then an outdoor TV might fit that bill. 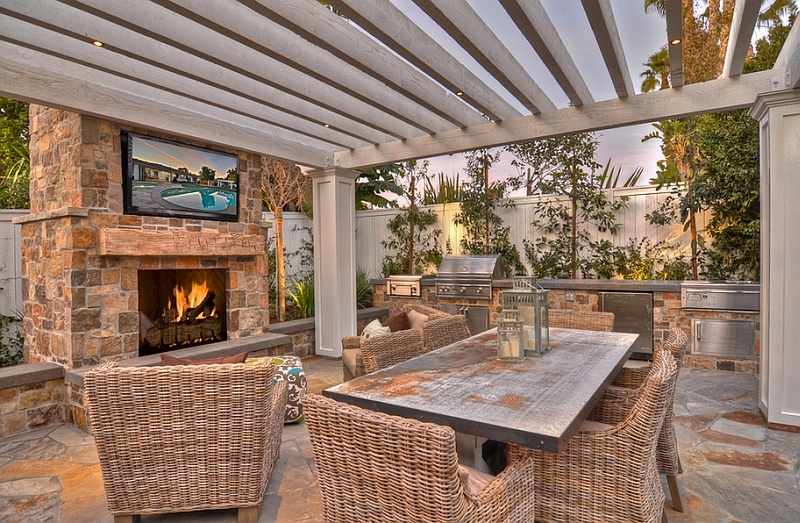 IDS can get you set up in no time with an outdoor TV and speaker system. You won’t miss any family time, and you just might start spending even more time outdoors. That’s a win-win! Contact us today for a free consultation. We can work with any budget, and any outdoor space. Call 516-625-6060 or visit https://idsaudiovideo.com/solutions/outdoor/.